All of you who commented that both you and your kids loved this series, you were so right! This was such an interesting series. Structurally it is so simple. We have five friends, each of whom gets to be the pov protagonist in one of the five linked novels. 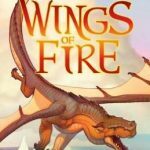 Each of the young dragons goes through a tailored adventure in which he or she learns and grows in ways specific to his or her personality. During the upcoming Archon, I’m on a panel about writing supporting characters, and I will definitely be using this series as a wonderful choice to look at how a large cast of supporting characters can be handled so as to support the main character’s arc without distracting from it, with this added advantage of the rotating main character. The characters are fundamentally simple, too. Clay, the nurturing MudWing. Tsunami, the impetuous, aggressive SeaWing. Glory, the sarcastic, prickly RainWing. Starflight, the insecure, timid NightWing. And Sunny, the cheerful, optimistic SandWing. I started to say that Glory is my favorite, and then that Sunny was, and then I gave up because it’s hard to choose between Glory, Sunny, and Clay. The plot is mostly simple, but not quite. We have a prophecy about five dragonets stopping the war, we have five dragonets, and there we go. Except! I am so pleased / so annoyed because Sutherland subverts the prophecy in almost exactly the way I always wanted to subvert a prophecy! So clever, and did I mention Sunny is one of my favorites? I loved loved loved how the prophecy was handed in her story (the last one in the series). Plus I only halfway predicted the ultimate resolution of the main problem; so cool to be half wrong in an unexpected way. Better for Sunny, too. But now if I want to write a story with a prophecy and subvert The Chosen One trope, I’ll have to come up with something different. What is not simple: the writing. Tui Sutherland is really gifted. It’s tough to handle a big cast of characters — I haven’t even mentioned the enormous number of secondary characters — Peril and all the queens and Morrowsight and Thorn and charming little Kinkajou and Smolder and on and on. Sutherland makes them all distinctive and brings them all to life. The dialogue is wonderful. The pacing and tension are wonderful. The detailing is wonderful. I’m sure Sutherland knows that Komodo dragons hunt the same way she has NightWings hunt. Ugh. But cool that she did that. Worldbuilding: Delightful! Not altogether believable, but that would be asking a lot. If I wanted to write MG, I would re-read this series very carefully and think hard about things like: Simple characters that learn simple lessons, but are totally believable and charming and the reader can’t help but root for them. Simple plots that build tension through action and crisis, so the reader can’t help but be drawn in and then pulled along. Bad guys and brutality, redacted just enough for younger readers — there is quite a lot of brutality and death in this series, so it’s interesting in the what’s-acceptable-for-MG context; also as an example of how to handle these things in an age-appropriate way. And anybody could read these to take a look at excellent dialogue and description. Moving on: I see there is a linked set of five more books that continue the story with a new set of protagonists (earlier group continues as supporting characters). I don’t plan on going on with those books this second (jeez, I already HAVE a lot of books on my TBR pile! ), but I do plan on picking them up in the not-too-distant future. You’ll notice that none of us who have read the series commented on your prophecy prediction. I at least didn’t want to spoil it for you. ;) I do hope you continue with the second series – I think it gets even better, if that’s possible. The third book in the new arc even puts you inside Peril’s head. I certainly did notice, and I appreciate it! I will definitely continue, I’m looking forward to it, especially Peril (poor Peril! I want her to have a happier life!) but it doesn’t look like all five books are out yet, so no rush. Yes, the biggest downside to being caught up is that there’s still a giant What Happens Next?! feeling once the book is done. I think the second set is even stronger than the first. I really love Winter and his “You are NOT my friends!” attitude. Exactly, so I figure I’ll wait till they’re all out. I won’t forget because I got the first one and it can sit on my TBR pile and remind me. Incidentally, the decision to wait to start the second series was helped along by the HUGE price increase between the 1st book of the second set and the 2nd. Suddenly the price nearly triples. Not too eager to pay that much when I expect the price to fall in a year or two.